I have worked around the corner from PA Crowe for over 10 years, yet it was only two months ago that I really became acquainted with them. Why? Partly because I discovered Graham Browne early on – the bespoke tailor only slightly further away that I have been covering for almost all of that decade – and partly because I simply had no excuse to. Eventually Mark Whitfield, the ever-dapper front-of-house you can see pictured below, offered an official invitation following a chance encounter at the BTBA dinner last year. 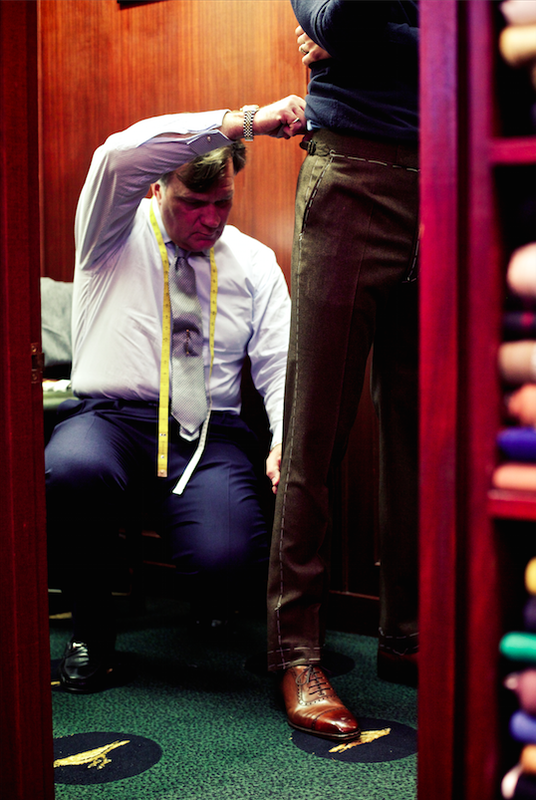 PA Crowe is a bespoke tailor. It has been around for just over 100 years, and absorbed a few other names in that time – as with most British bespoke outfits. 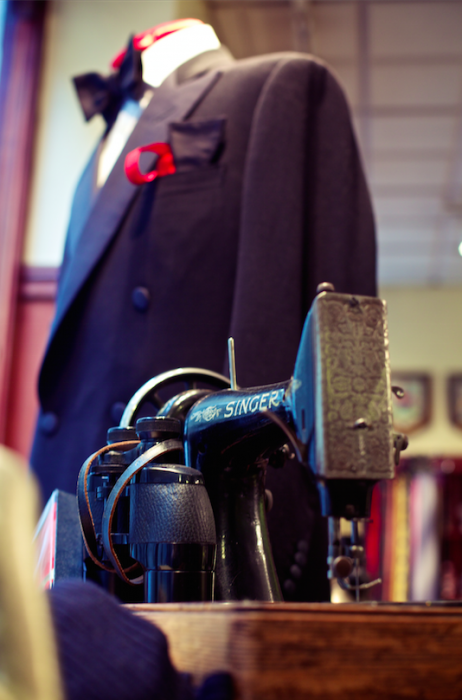 It is now owned by Mark’s family, and he runs a shop comprising himself, cutter Keith and two tailors. Although alterations and other work can therefore be done on site, most of it is given to outworkers (in common with most of British bespoke). That’s Keith below, carefully cutting a nice piece of blue flannel. And above, Mark is fitting me for a pair of brown flannel trousers. I decided to take an old piece of Barberis cloth to them to have made up, in order to more thoroughly review the service. Brown is a much-underrated colour for separate trousers, in my opinion. It goes particularly well with navy jackets and feels more contemporary in that combination than classic colours such as cream and charcoal. The trousers were cut to a nice line and Mark understood clearly my preferences for the rise and slimness of the leg. The front of the trousers, however, have proved troublesome. They consistently collapse below the waistband, creating a lot of folds either side of the zipper. I know from experience that it is difficult to cut slim, flat-fronted trousers to my figure, with the slimness of waist and large seat making it tricky to have enough space in the trousers yet retain a slim line. I am having a charcoal pair made at Chittleborough & Morgan at the moment and this has been the biggest issue. 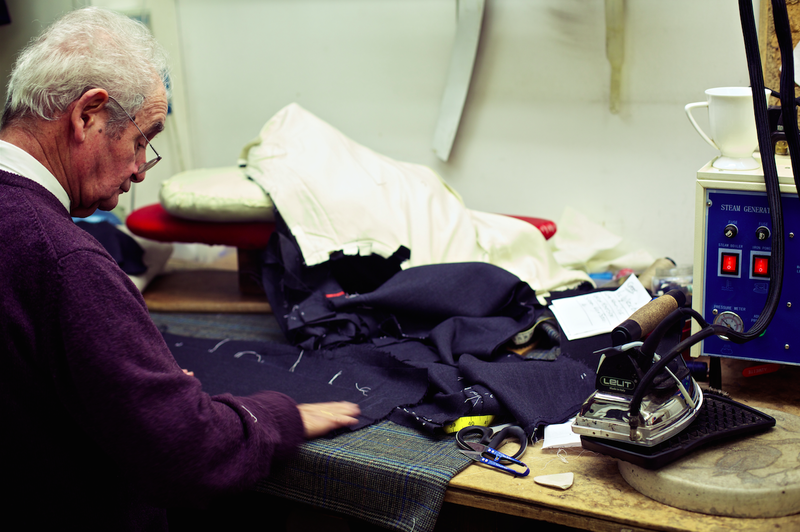 However, other tailors have accomplished it, with those from Elia Caliendo and Cifonelli probably being the best. The several pairs I have from Anderson & Sheppard are also good, and I loaned Mark and Keith a pair of those as a shorthand for my preferences in design and shape. We are having another go at the trousers and will see if we can rectify the issue. I can, however, wholly recommend Crowe’s valeting of suits and jackets, which I tried out on two old pieces. 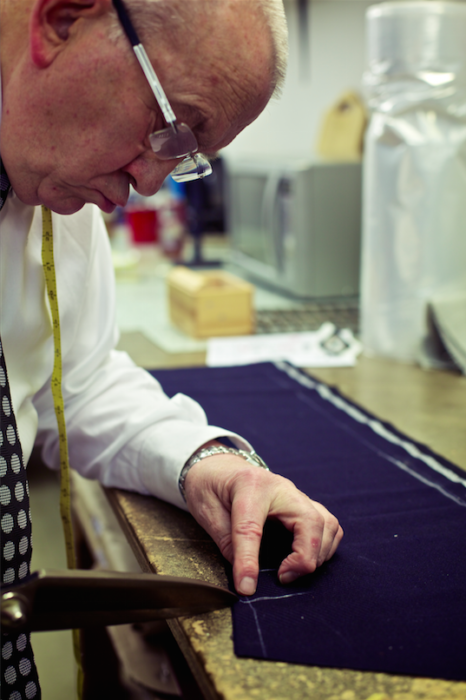 There are few tailors around who will take other people’s work, get it cleaned by someone that understands bespoke tailoring, and then press it to perfection when it is returned to them. It can give a whole new lease of life to a suit. PA Crowe suits start at £2200. 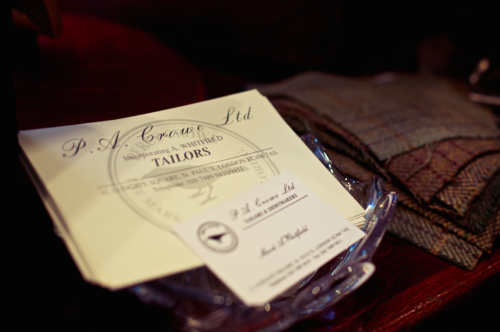 You can follow the discussion on PA Crowe: City bespoke tailor by entering your email address in the box below. You will then receive an email every time a new comment is added. These will also contain a link to a page where you can stop the alerts, and remove all of your related data from the site. Simon. At last you have mentioned my Tailors. Well done !! What is the price for the flannel trousers? I completely agree about brown. I love grey as well but I sometimes worry that, especially when paired with a blue jacket, it gives off far too much of the “retired gentleman spending his afternoons at the golf club” vibe. What shoes would go best with a pair of brown trousers? Ah, it’s a tricky one. With very dark brown trousers, black can work. But otherwise you’re stuck with a very-dark brown shoe (darker than the trouser) or going to the other extreme and having tan. Most things in between might match too closely. just as brown trousers match a dark blue jacket, obvious shoes to wear with them are dark blue. While for some reason navy shoes have been hard to find, that is changing – Justin Fitzpatrick does a number of interesting models in navy. Not for me I’m afraid Jonathan. Or go “crazy” with a pair of navy shoes. Your comment about the cloth under the waistband collapsing is interesting as i have the same experience even though i do not have the same build as you. It invariably results in the trousers being ‘pulled up’ in this area and re-stitched. In some cases this is successful – in othgers not. I assume this would be to do with the fabric? On another matter would not dark burgundy leather shoes go well with brown trousers? Wouldn’t burgundy match brown trousers? Especially Horween colour #8. Hi Simon. How much do they charge for the valeting of a suit, please? In terms of valetting, how do they measure up against Burford’s? Do you have an idea of the price for the valeting? Why not brown trousers paired with oxford in racing green? No that could work. A little daring and dependent on the exact tones, but yes it could. The darker the better (in both cases)! Oo, that’s a big one James, and yes I’ve covered it quite a bit. Have a look at my first posts on both Satriano Cinque and d’Avino, and you’ll get an idea. It’s a big difference – perhaps the greatest of any sartorial area. And both those guys visit London. Satriano once a month or so, D’Avino less regularly. I’ve been going to P A Crowe for fourteen years now and I have always been very happy with their suits (which seem to get better with each new one) and found Mark’s expert opinions especially helpful. Recently, I was about bag up a couple of eight year old suits for the charity shop as the linings had gone and they were beginning to go shiny. I’m so glad I took them back to Crowe though. They have been steam cleaned and relined and they now look so much better than I could have ever expected. They really do look as good as new and with the new and different linings I can almost convince myself they are. Simon. How much are trousers at Crowe’s. ? My thinking is around the Row level. They make for a couple of my work colleagues. I don’t want to ask! Please can you help. Given the 2x price difference with Gordon Browne, how does PA Crowe distinguish themselves? More handwork/better workmanship? I like your shoe in the photograph in the fitting room. Who made them and what is the model name? Simon. Great to read your work on Crowe’s. They are our family tailor for years. There workmanship and customer service are second to none. They have just made me a grey flannel suit. I feel wonderful when I wear it! Please post this. I have been a client of P A Crowe for the best part of 40 years wearing their suits on a daily basis. Their suits have proved to be perfectly cut and what is more important very economical. Few men appreciate that a suit properly made and looked after can last almost indefinately. Should you, like me, be inclined to fill out then you simply take them back to Crowes and they will be readjusted. I found Crowe’s through this blog and after my experience there I had to leave a comment. I’ve recently had a Fox Brother’s grey flannel suit made and I couldn’t be happier. Looking forward to going back to have a sports coat made in the near future.